Problem: The stock-configuration places a constraint on the locker operation: You must have the transfer case set to "4-Low" to engage the lockers. If the transfer case leaves 4-Low while the lockers are engaged, they will be disengaged automatically. 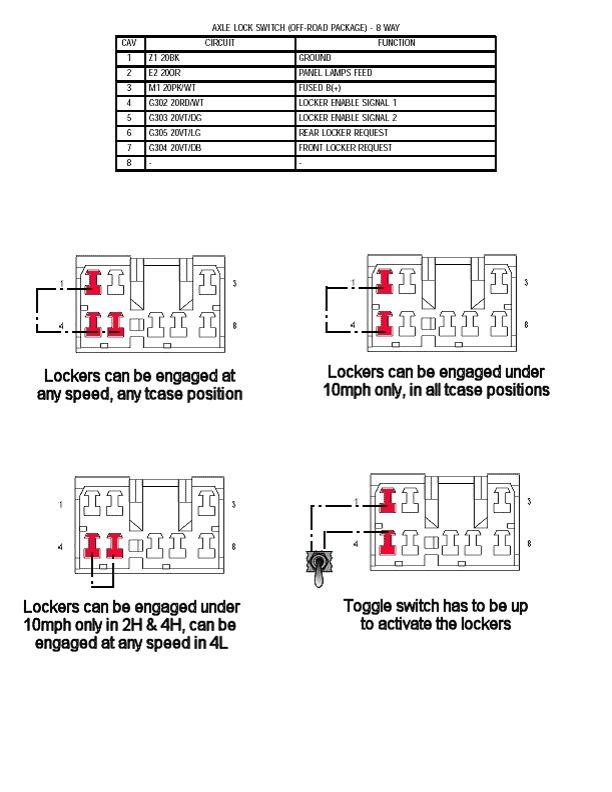 Why would someone want to have the lockers engaged in 4-High? Sand, and obstacles strewn with sand. Solution: Add a switch to the front panel that will convince the ECU that the transfer case is in 4 Low when, in fact, it is not. The locker override does not require power (except for the LED in the switch), but the LEDs in the control elements do. Current draw due to my circuit is low (< 60mA), so I wired the LED's directly into the non-switched battery drop that I installed for the radio. I spent a little more time and money on making the control elements aesthetically appealing. 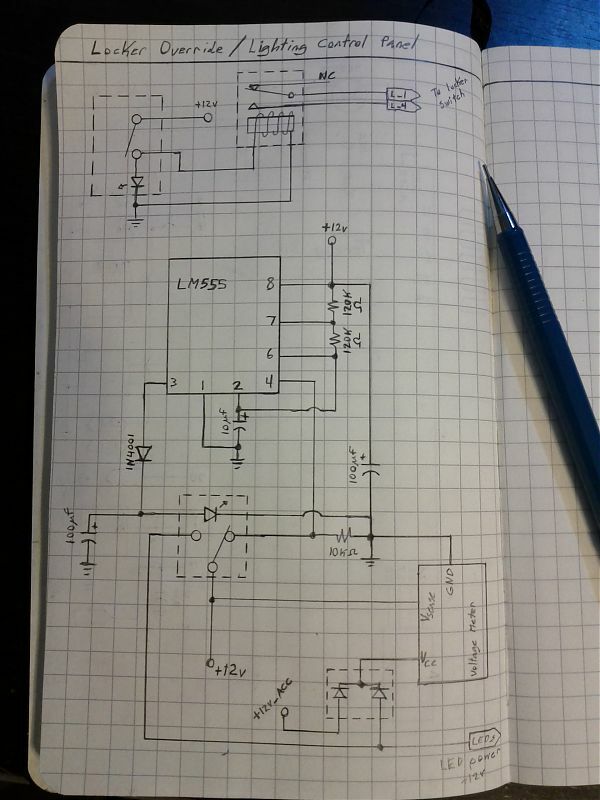 I added a 555 timer circuit with a diode/capacitor on the output to cause the button LED to fade out while it blinks. When the lighting is active, the threshold pin on the timer is disengaged from the power source, pulled low, and the button LED lights up solid as a consequence. The 555 is rated for 15v, so I used minimal filtering and no regulation between it and the rest of the electrical system. The two diodes facing inward form a simple OR gate with this expression: When the accessory switch is on OR the lighting button is active, turn on the voltage meter. 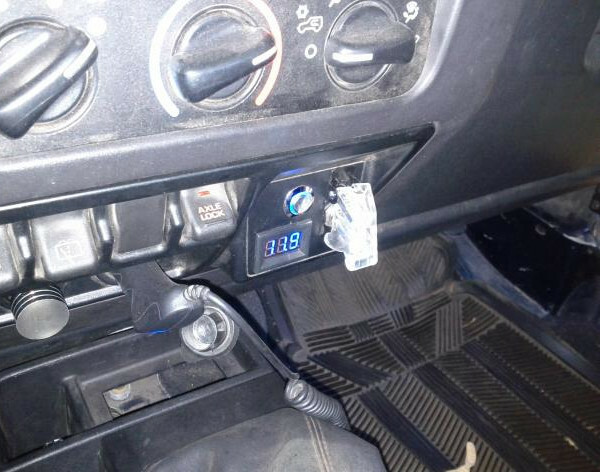 This causes the meter to behave like the other interior lights UNLESS the undercarriage lighting is enabled. After testing on my breadboard I quickly found a deficiency. The super-cool switch that I ordered to operate the locker override had one pin that was common to both the switch AND the LED inside the switch. This would have been fine had that common pin not been the LED's anode. Not wanting to expose the ECU to voltage from the rest of my circuit, I finally broke down, cried a little, and installed a relay. I thoroughly tested the entire setup, cut the holes in the dash panel and installed it. Because everything in the Jeep is subjected to an obscene amount of vibration while off-road, I soaked the inside of the panel with two-part epoxy to hold all my work in place. I didn't trust the water-proofing that the modules shipped with, and so I added a drop of urethane to each LED-well to protect them from the small bits of rock and dirt that will surely be insulting them.